This page lists upcoming STAR Science Forum seminars. Presentation materials for seminars will be posted with each scheduled talk when available. To submit a new seminar for the series, fill this form: STAR Seminar Form. In situ validation of ocean color satellite products is critical in determining the accuracy and reliability of the distributed products. NOAA STAR has been conducting ocean color validation measurements in all types of waters for over 25 years working with international, government and academic partners. With the operation of NPP and NOAA20 VIIRS satellites, the validation work has expanded to include annual dedicated validation cruises aboard NOAA research vessels with the goal of providing the best validation for VIIRS, determining the uncertainties for the in situ/satellite matchups, and characterizing natural optical variability in the ocean. 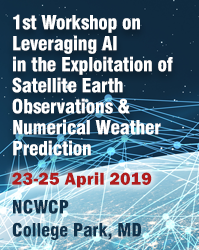 This presentation will highlight recent calibration/validation activities, discuss identified in situ measurement uncertainties and evaluate VIIRS performance. Michael Ondrusek is an Oceanographer for the NOAA Center for Satellite Applications and Research (STAR) He served as the Division Ocean Color Science Team Lead and the Ocean Color Product Oversight Panel Co-Chair from 2006 to 2011 and the Marine Optical Buoy PI from 2007 to 2010. His research interest includes ocean color calibration and validation, satellite ocean color product algorithm development, primary productivity, phytoplankton pigments, and phytoplankton ecology. He has extensive sea-going experience including the MOBY/MOCE projects, the IronEx experiments, and the JGOF programs. He has served as Chief Scientist on four annual NOAA dedicated Cal/Val cruises since FY2015. Similar to CrIS, PanFTS is a Fourier transform spectrometer (FTS). CrIS is a point mapping spectrometer. It has three different spectral bands of 3 x 3 photo detectors, mapping 9 ground pixels simultaneously. PanFTS is an imaging spectrometer. It has 1 - 3 imaging cameras, mapping 0.3 - 1 million ground pixels simultaneously. The several orders of improved observation throughput is enabled by the high speed cameras and the matching high speed onboard data processing electronics. PanFTS successfully completed a NASA Earth Science Technology Office Instrument Incubator Program (ESTO IIP) task in 2011. An engineering model (EM) was built. PanFTS - EM spanned 0.29 - 16 um wavelength, and it could achieve a spectral resolution DeltaR = 0.05 cm-1. PanFTS - EM performances were characterized in a thermal vacuum chamber at 110K, and the results were independently reviewed. However, PanFTS - EM occupied a ~1.5 m3 volume. We propose to miniaturize PanFTS (uPanFTS) into a ~6 - 12 U volume using a 2-color camera technology. This camera technology has been developed by the DOD sponsors over the last two decades, and it is currently deployed in the fields. Mr. Yen-Hung (James) Wu is an optical system engineer at the NASA Jet Propulsion Laboratory. He has worked on a variety of NASA and non-NASA projects, ranging from a cubsat imager to a deep UV spectrometer on the Mars 2020 Rover to a laser metrology for the NuSTAR x-ray space telescope. He has been working with the team to develop PanFTS since its conception in 2007. Currently, he is leading two JPL internally funded strategic R&D tasks to 1). miniaturize the front end PanFTS instrument hardware suitable for the future solar system and planetary exploration missions, and 2). advance the PanFTS back end data interface / real-time processing to the operational science quality. On the left, above 'My Calendars', click 'Add' and then select 'From URL'. Then the STAR Seminars calendar will appear on the left side of your calendar controls under 'Other calendars'. It may take up to 12 hours for changes to appear in your Google Calendar. Use Google Chrome to remotely join Webex sessions for STAR seminars. Webex's required plugin is built-in to Chrome. If you want to use Webex from Firefox, you must arrange to have the AdminLAN team install the plug-in on your computer in advance of the seminar you wish to attend.